A very unsettling and odd vanishing happened to Christopher Thompkins from Ellerslie, Georgia. He was last seen by work mates standing on the shoulder of the road facing the woods at 1.30pm on 25th January 2002. He literally vanished within seconds leaving the survey crew very perplexed. 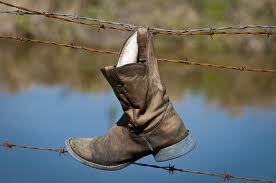 They walked back to where they had seen him only to find his boot hanging on the barbed wire fence along with blue fabric from his pants. On the ground beneath were coins that had fallen from his pocket. The woods on the other side of the fence were inhospitable and swampy. David Paulides, former lawman turned investigator, tells us that during his time working with traffic accidents he has seen shoes left behind by people who were literally “hit so fast that they were knocked right out of them”. He says that logistically it looks like Christopher was reefed out of his boots and dragged through the fence in such a position that all the coins fell out of his pocket. When gravity drags coins to the ground it means that the opening for the coins was either facing the ground or the container holding the coins was removed at a great speed - very similar to the magician who removes the tablecloth without disturbing the cutlery. This means that Chris was either upside down or sideways. Six months later the rancher who owned the land found the other missing boot 900 yards away next to the swamp. Christopher Tompkins is still missing. A moment’s opportunity seems to play a big part in these disappearances. A young boy disappeared from his camper where he was sleeping with his sister and the family cat while their parents walked about outside. Within seconds of the parents walking behind a tree they heard their son scream and ran back to the camper to find the door open and the boy missing. The girl and cat was still asleep. The child is still missing. "After reading "It takes people in a flash" I get the impression whatever is doing the "taking" does not want to be seen. Is this its weakness?, if its seen would the spell be broken would we be able to combat this entity if we saw it. Just a thought. But, remember, we must think, theorize and explore every notion no matter how strange or stupid it seems to the people around us." I think many of us have the same thoughts... we are the ones being picked on and used for advantage just like the helpless fish. Our world and everything in it being used by something larger than ourselves and beyond our control and understanding. Comment - After reading "It takes people in a flash", I get the impression whatever is doing the "taking" does not want to be seen. Is this its weakness?, if its seen would the spell be broken would we be able to combat this entity if we saw it. Just a thought. I find this case the strangest of all the cases Paulides discussed with George Knapp. It makes no sense for Tompkins to have run off over the fence into the swamp, and if someone held him at gunpoint, why would he leave one boot behind (and then later another boot on the other side)? Utterly perplexing. The one where the guy climbing Mt.Rainier disappeared off the end of the rope stuck with me. He was climbing with others on the same rope and was one of the most experienced Mt.Rainier climbers in the world. but where did he go under such conditions and why wasn't more press coverage given to this? ALL of the "Missing 411" material is fascinating.